There is nothing as pleasant as having a fresh breath during the entire day, especially when you are on the go. The toothbrush is the one personal care object that is essential and that can help you maintain a fresh breath, healthy teeth, and an excellent first impression. No matter if you are a traveler, a businessperson or an office person; a portable toothbrush can be a life saver. You might say that there are plenty of other products and methods that can help you maintain a fresh breath during the day, such as menthol drops, spray fresheners and much more. However, there is nothing like those traditional, real toothbrushes that can help you freshen up in just two minutes. The market is rich in portable toothbrushes that you can take with you anywhere you go, be it a long trip or just a typical office day. However, not all portable toothbrushes offer the advantages that you might need. In this article, we have reviewed five of the best-selling portable toothbrushes that the market has to offer, to give you a better perspective on the current options. You might find that we have looked at all of the above factors that could influence your decision of buying such a product or taking your eyes off it. Except for the features mentioned above, you can also make a decision based on the differentiation between electric and non-electric toothbrushes. But regardless of the choice that you will make, it is important to make a proper analysis before buying your next portable toothbrush. High-quality toothbrushes that are portable and comfortable to use are difficult to find. Most manufacturers transform the concept of portability into a totally different concept that involves tiny objects and tiny accessories. If you are looking for a portable toothbrush that is both comfortable to use and nicely designed, you should take a look at this product. It comes with a compact design, it has 40,000 strokes per minute and comes with a UV sanitizer that is meant to kill most of the bacteria that it comes in contact with. The toothbrush has a plastic case that includes a plug charger. The battery lasts for about two weeks if used twice per day. This product looks like the perfect oral care companion for your journeys. What’s to like about the Travel Sonic Electric Toothbrush with UV Sanitizer Case? This portable toothbrush is the ideal oral care product to carry with you everywhere you go, as it is lightweight and easy to use. After using it, you just have to wash it and put it back in its case in order to sanitize it efficiently. The fact that it comes with a UV sanitizer is a big plus for most of the people who are obsessed about getting rid of the bacteria around them. Although this product is affordable, performant and efficient, it stops after 4 minutes of use, in order to prevent the misuse of energy. In most cases, though, it interrupts a user’s brushing, which can be quite annoying. Other than that, this is a great product. If you are more of a person with traditional tastes, this electric toothbrush could be what you are looking for. It is a product with simple features and a classic case that basically encompasses the body of the toothbrush and its cap. It is easy to carry around, as it occupied minimal space in your purse or bag. It operates on AAA batteries and it also includes one in the package. 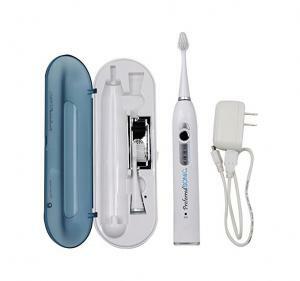 This portable toothbrush is great for people with sensitive teeth or gums, as it has 22 000 strokes per minute, which is great for someone who cannot use powerful electric toothbrushes. The great thing about it is that it includes two brush heads, which means that you won’t have to make further investments. Its size of 0.8 x 0.8 x 6.2 inches and its weight of only 1.9 ounces makes it ideal for traveling. What’s to like about the Violife Slim Sonic Toothbrush? 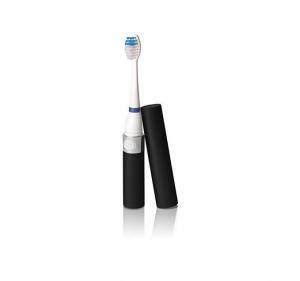 The fact that this sonic toothbrush is highly portable and so easy to use makes it ideal for people who travel a lot or are extremely busy during the day and prefer to do everything on the go. This product comes with a compact and functional design, a rather small head and 22,000 strokes per minute, which is great for all types of teeth. If you are a technology enthusiast and you like your oral care products to have all sorts of features, this is not the best choice for you. This portable toothbrush does not have a timer or any smart features whatsoever, so it is rather suitable for individuals with conventional tastes. 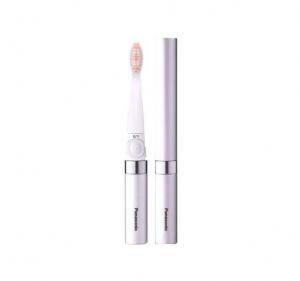 Do you want to find the perfect portable toothbrush that is both efficient and feminine? Either you need to find one for yourself or you want to make a present, this is one of the best options on the market when it comes to oral care and portability. This toothbrush comes in a stylish silver case; it has a minimal design and features that will help you maintain the health of the teeth and gums. This product has a triple-edged brush head, which means that it has three bristle types and is able to remove plaque in an efficient way. It is battery-operated and able to function for approximately three months using no more than one AAA battery. Its cap is easy to remove and put back on after washing your teeth. What’s to like about the Panasonic EW-DS90-S Compact Battery-Powered Toothbrush? The portable toothbrush that Panasonic brings to the market is classy and ideal for women who feel the need of a fresh breath under all circumstances. It is a lightweight product that can be stored anywhere; it comes with advanced technical features and a convenient shape. Also, it is battery-operated, which means that no cables are involved during its use. This Panasonic portable toothbrush is practical and nicely designed, but the power and frequency of its strokes are considered to be a weak point by consumers who are used to more powerful products. The 16,000 strokes per minute are ideal for people with sensitive teeth and a low tolerance to strong vibrations, though. If you are looking for a portable toothbrush that is powerful and has a convenient design, this is one of the best cheap alternatives to very expensive similar products. The Violife sonic toothbrush has a simple and compact design, comes with a replaceable head and 22,000 sonic strokes per minutes. Just like most similar products, it is a vibrating toothbrush, not a rotating one. It has a simple, purple case that is made of plastic, a moisture-releasing vented cap and a replaceable head. Its waterproof battery compartment makes it safe for you to change its battery whenever it is needed. Also, its motor chamber is water tight, so you are completely protected from any type of risks. The bristles of this toothbrush are soft, which makes it suitable for sensitive teeth and gums. 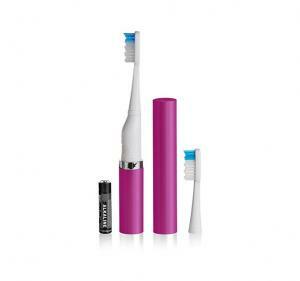 What’s to like about the Violife Style Slim Sonic Electric Travel Toothbrush, Purple, 2.5 Ounce? Giving the fact that this portable toothbrush is inexpensive, it is a good option for those of you who are on a budget, yet would like to buy a product that is efficient and durable. This product’s manufacturer offers a 6-month warranty, which is reinsuring when it comes to the quality of the brush. Also, it is battery-operated, it is comfortable to use and its size of 1.5 x 2.5 x 6.8 inches is ideal during traveling. This toothbrush’s case is entirely made of plastic and has a cheap aspect. Not that this is necessarily a bad thing, but if you are a person with pretentious tastes, you will want something a bit more stylish in your toiletry bag. If you generally care a lot about hygiene and you are afraid that the large amount of bacteria around you could affect your oral health, this product could help you feel safer. It is an FDA medical device that is meant to kill bacteria that you could ingest while using any toothbrush. 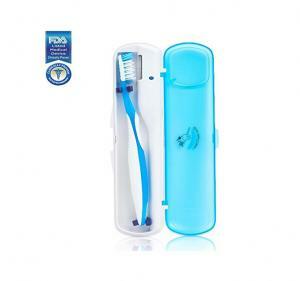 This case is equipped with advanced UV technology and fits any type of toothbrush, be it traditional or electric. The Oral SteriClean does not include an actual toothbrush. Its size of 9 x 2 x 4 inches is ideal if you want to take it with you anywhere you go. At its 4.8 ounces, it is also lightweight and easy to carry around. What’s to like about the Oral SteriClean Portable UV Toothbrush Sanitizer, FDA Listed Medical Device? This product is a medical device that comes with plenty of features that would determine anyone to buy it right away. It can be fit in all types of purses and luggage, which makes it perfect for travelers. Also, it automatically turns off when it is not used and it operates using AAA batteries, so it does not need recharging. More than that, it is equipped with a safety switch, an advanced UV lamp and a rubber clip that helps you keep the toothbrush in place. The Oral SteriClean is an amazing device that can keep you away from serious health issues, but it would be so much more attractive to customers if it would also include a portable toothbrush. Why should you choose a travel toothbrush over a regular one? A toothbrush is indispensable and your teeth need it at least two times per day, but you already know that. When traveling, you probably wonder if you should take your regular toothbrush with you or buy one that is especially designed to occupy less space, but still be very effective. Portable toothbrushes are designed to meet your needs while traveling, without stealing the advantages of regular ones. The difference between the two is more often than not, the size. The second most important difference is the storage. Most models come with a special case that protects the brush from bacteria, so that you feel safe while taking care of your teeth. If you feel that an electric toothbrush is better than a traditional one, you are probably right. The good news is that manufacturers focus on quality nowadays, so you can find electric toothbrushes that can be easily packed. Philips and Oral B are just two of the most renowned toothbrush creators that thought about this important detail. Portability is a priority nowadays and oral care makes no exception when it comes to this aspect. So, if you are thinking whether to choose a travel toothbrush over a regular one for your trips, the answer is yes. Is a portable toothbrush worth it? Although you can find inexpensive portable toothbrushes on the market, giving the rich offer available today, it is important to think about quality, durability and ergonomics. It is wise to think in perspective and understand the benefits of oral care if you want to lead a healthy life. This is one of the most important reasons why you shouldn’t prefer to pay less. Just like you prefer to buy high-quality body care products, toothpaste, make-up or food, you shouldn’t treat your body worse than it deserves. If you already owned a few portable toothbrushes, then you might wonder why their design should always be foldable. The truth is that they don’t have to be designed that way to occupy less space. Although the ones that fold come with an integrated protective cap, slightly larger toothbrushes that aren’t foldable can be as easy to pack as smaller ones. The most important advantage that a product designed for traveling should have is its protection against dust and bacteria. The more you are interested in quality, the more money you will have to take out of your wallet. The good news is that you will be investing in your teeth. How to take care of your teeth properly when traveling? Experts recommend to treat the cleanliness of our teeth seriously at all times in order to avoid future problems that we all know can lead to immense discomfort. If you care about this aspect, then you should know that there are a few things that you can do except for brushing your teeth regularly while traveling, just like you do at home. For instance, you can choose a healthy snack instead of fast food. Try to floss every day if you want to ensure that no food remains attack your teeth. Also, never go to sleep without brushing your teeth. It can be easy to find a good portable toothbrush or a high-quality sanitizer when you know exactly what you need. But for most people, that isn’t always clear. After reading the reviews above, you should be able to figure out whether you need a traditional toothbrush that does not come with advanced features or an electric toothbrush that often includes a timer or other characteristics. Buying a sanitizer for your portable toothbrush is equally important, as you never know what the cause of your health issues could be. Germs and bacteria are well-known for causing infections, gum disease, heart disease or respiratory infections, which is why it is extremely important to choose the products that you use for your daily oral care paying attention to the details. Therefore, choose a convenient toothbrush that suits your needs, helps you maintain a fresh breath and helps your teeth look healthy and beautiful.